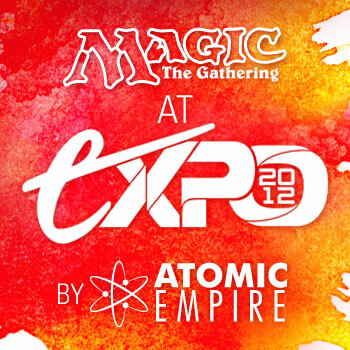 As we've already announced, The Escapist is going to have a pretty big Magic: The Gathering presence at this year's Expo in Durham, NC September 14-16. Working alongside our organizing partners, Atomic Empire, we've got numerous DCI-sanctioned tournaments already lined up, not to mention former World Champion Magic pro and Gamers Helping Gamers co-founder Jon Finkel showing up for the event. So now that the Expo's event registration is officially live, we're ready to go into what we have planned with a bit more detail. Here's our schedule in full for the entire Expo weekend! Saturday, September 15th, 10:00 A.M.
Pre-Register here. Players who pre-register by 8/23 will receive an exclusive playmat! On-Site registration will be available until 11 P.M. Friday night, and will reopen at 8:00 A.M. Saturday morning. The tournament will consist of multiple swiss rounds based on attendance, followed by a single-elimination cut to the top 8. First place will take home a Mox Sapphire (a $600 value). Prizes will be provided by Atomic Empire and other sponsors and will include custom artwork by card alterists. On-Site Registration opens one hour before start and closes 15 minutes before start. Each player will receive 6 boosters to build a 40-card deck. Four swiss rounds, prizes paid out based on record. Sunday, Sept. 16th, 11:00 A.M. On-site registration will be open 1:00 P.M.- 11:00 P.M. Friday and 12:00 P.M.-10:00 P.M. Saturday. Each team will receive eight Avacyn Restored boosters to build two 40-card decks. Come by our booth in the Junior Ballroom at any time for a free starter deck and tutorial game! Weekend-long events have no specific start time. Registration for these events is continuously open and each event will start once the appropriate number of players has registered (subject to space and judge availability). Draft pods will use Magic 2013, Innistrad/Dark Ascension, or Avacyn Restored by player choice and availability. Prizes will be issued from the sets drafted. Friday, Sept. 14th, 1:00 P.M. through Saturday, Sept. 15th, 9:00 P.M.
Sunday, Sept. 16th, 10:00 A.M. to 2:00 P.M. Booster Drafts: 1st: 5 boosters, 2nd: 3 boosters, 3rd & 4th: 2 boosters each.